Kennedy Instruments Ltd (who also manufactured the Ilford Advocate) were a wholly owned subsidiary of Ilford Ltd. 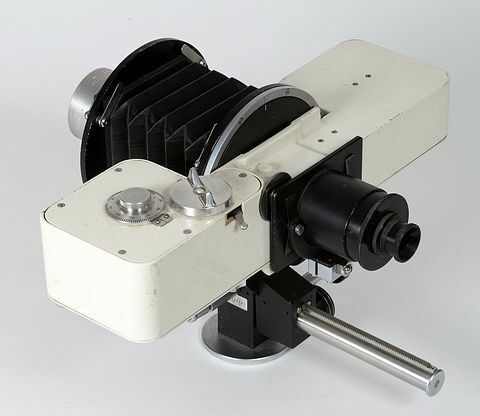 The Kennedy Instruments Ltd (KI) Monobar 35mm camera was first produced in 1958 and continued in production until 1965. By 1967 it was being sold as redundant stock by Martson & Heard for £60 (see Amateur Photographer magazine for 6th September 1967), against the previous list price of £180 (£150 for the camera and £30 for the film back). 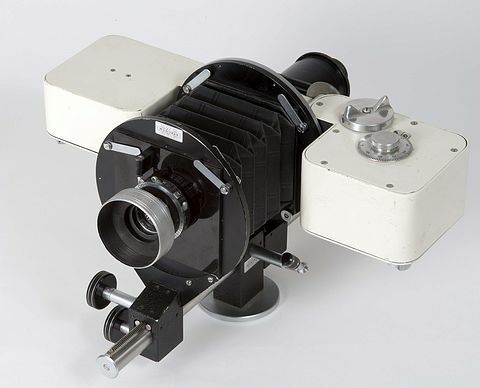 It provided the range of lens panel movements normally associated with a large plate 'field' camera (see below, RHS). This made it suitable for technical, architectural, medical and other specialised uses. It had a rising and falling front, swing and tilt, with the same movements at the rear, plus 360degree revolving back and ground glass screen with magnifier. The bellows provided a 12" extension. A precision pan & tilt head was included. The Amateur Photographer magazine Cameras Guide supplement for 8th June 1960 describes two variants. 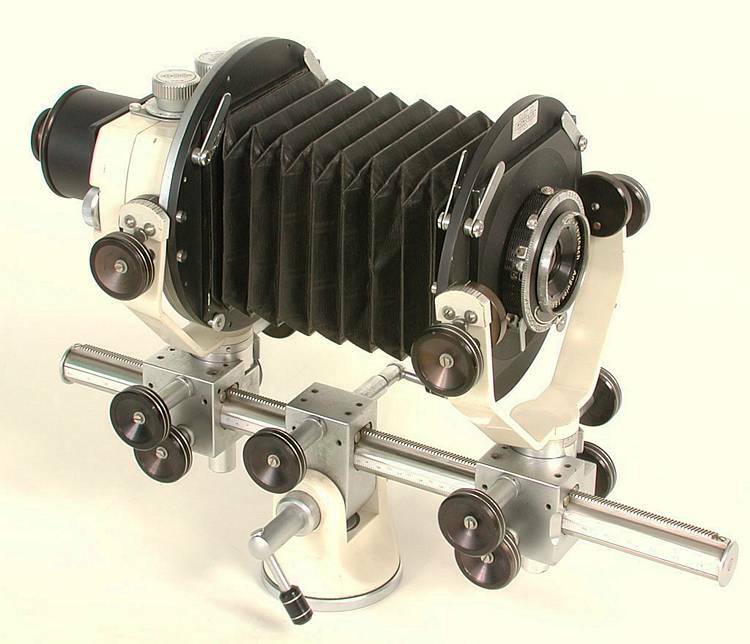 The Monobar Type U, with the full range of movements (1½" rise and 30deg vertical and horizontal swing movements either way) and the Type F, which was a simplified version for photomicrography, macrophotography and copying, where no 'correcting movements' were required. It had a 35mm film back (see below, LHS) with a hard-stoved ivory enamel finish, which bore a resemblance to the Advocate camera. It also bears resemblance to the Kennedy Instruments (ILFORD) FilmStrip Printer. The pictures below are all courtesy of Doug McKee. Click the small picture (left) or here to download a copy of the original instruction booklet for the Type U & Type F Monobars. This booklet was made available by Emrys Sparks, who used a Type F for nearly 30years in his job of Director of Medical Photography and TV at St Mary's Medical School. Emrys has kindly provided me with a short account of his working arrangements at St Mary's, including use of the Type F.
Click here to read that information on a separate web page. Two more pictures, below, from Doug McKee. The first (left) shows his earliest Type U Monobar (Doug has two - note the 'bag' bellows compared to the illustrations above) while to the right is the 'simplified' Type F, as purchased from Emrys Sparks. To view a webpage showing all of the Monobar equipment purchased by Doug from Emrys, click here. Three Monobar film magazines for sale in 'London Camera Exchange' shop in Worcester. The film wind knobs on the top and bottom magazines are inscribed 'KI Monobar'. 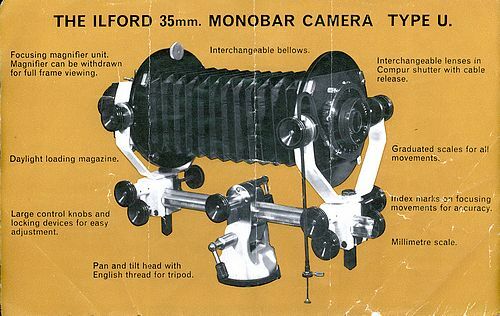 The 1962 British Journal Photographic Annual (BJPA) described the ILFORD KI Monobar Cameras as in the following text. Please Note: the picture below is courtesy of Doug McKee, scanned from an original Ilford colour brochure but showing, apparently, the same (prototype ?) version as in the lower quality image that appeared in the 1962 BJPA article. Thus, for the sake of enhanced visibility, the image below has been used in place of that in the BJPA. 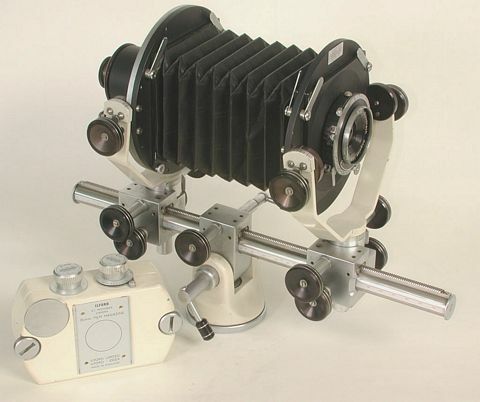 "This camera is manufactured by Kennedy Instruments Ltd, and is an attempt to provide the technical movement features usually only available in the larger format apparatus which has always held un-disputed sway in this field-for very good reasons. The problems of manufacture with the necessary precision are great enough in the production of the ordinary miniature with straightforward die-cast body and permanently fixed lens flange; when to this precision is added the requirements of accurate register of an interchangeable film magazine and ground-glass viewing system, provision of movements which can be zeroed with accuracy after much use and without developing any play etc., it is no wonder that the 35 mm technical camera is so rare, and that its price in this instance should be £180 without lens. What advantage can there be in the use of this format? This is probably the first question to come to mind. There is naturally the time-honoured one of film cost economy, and for some purposes the possibility of direct production of 35 mm colour slides. In addition there is the decrease in size, the KI bar is about 12 in. long, and the height without the rises is 9 in. In scientific work, the manoeuvrability of the camera and the consequent ease with which it can be incorporated in experimental set-ups will be found particularly welcome. The same comment applies to photomicrography and photomacrography, although here the full range of camera movements are not required, and the model type F without these is recommended by the makers. As regards industrial photography, the restriction of lens focal length must be taken into account; the shortest focal length which can be fitted is 2 inches (50 mm). This means that the range is over the long focus, and the wide-angle type cannot be fitted; this limitation is not insuperable for the availability of retro-focus wide-angle lenses in between-lens shutters would overcome it quite simply. The llford Monobar camera weighs about 9 lb (4kg), it fits into a poorly-made, composition case which has no carrying handle. (If this camera were Continental in origin, it would come in a superb practical carrying case, one look at which would prepare one for the first-class instrument inside). 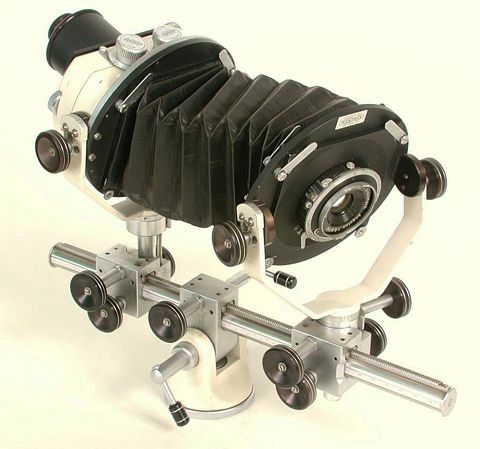 The lens-panel, bellows, back-plate, and movement control knobs are finished in black; the front and back forks, the pan and tilt head and film magazine are in the cream of the old Advocate cameras, whilst the bar and its bearings are polished metal. Movements provided are as follows: rise and fall of front and back over a range of l½ in. ; the horizontal and vertical tilt or swing move-ments on front and back all move through 30°, calibrated at 10° and 5° intervals. The monobar is graduated in centimetres and millimetres, and the bearing blocks carrying front and rear panels have index marks to enable readings to be made for front and back focusing. The back is fully revolving and has index marks for the horizontal and vertical formats, whether the back is rotated to the left or to the right. In addition to front and back focusing the whole assembly can be moved on the bar back or forward. All these movements move with precision and bode well for a long life, there is no trace of backlash, and if this should develop eventually there are spring tensioning screws which would reset the original inertia. The movements operating from the rack and pinion can be locked when set by other milled knobs below the control ones; the actual rack and pinion seems to be of the soft metal bearing on hard, essential for minimum wear. One would suggest some difference in styling or diameter should be made between the various control knobs, as one is rather inclined to turn the wrong one in setting up for exposure, perhaps with longer acquaintance this difficulty would not arise. The film magazine is of very sturdy design; it is opened by turning two coin-fitting screws at each end; there is a removable film carriage and pressure plate system into which the film is loaded, this presses the film into register on rails in the front of the magazine. Before exposure, a milled penny-sized wheel is turned anti-clockwise to open a shutter on the front of the magazine, and of course must be closed again before removing the magazine or changing the lens. Focusing is done, by the aid of a magnifier, on the ground glass screen incorporated on a spring-loaded slide, which enables it to be pulled back and the magazine substituted. The magazine locates directly by facing up to the camera back and has a light-tight insetting; it is held in place by returning the focusing screen assembly behind it and engaging a spring clip. Some improvement should be possible in this method, it is sometimes a little easy to think that the clip is engaged, when in fact it is not quite home. The KI Monobar is built on a pan and tilt head with bar-locks; mounted on a suitable tripod this forms a completely effective support for the instrument. The general impression is of superb workmanship, there are one or two criticisms that can naturally be made, for example, the magnifier is not full-field; this may necessitate its withdrawal for camera alignment and then replacement for focusing a number of times before exposure. Also on many occasions the exact field depth must be ascertained, and in the 35 mm size this is almost impossible without a magnifier over the whole field. For the same reason a condenser lens with a ground piano-surface might be suggested as an alternative to ground glass to give better brightness with the small lens apertures often used in working with a technical camera. The Ilford 35 mm Monobar Camera, Type U, with one blank lens panel and one magazine £180 0s 0d. 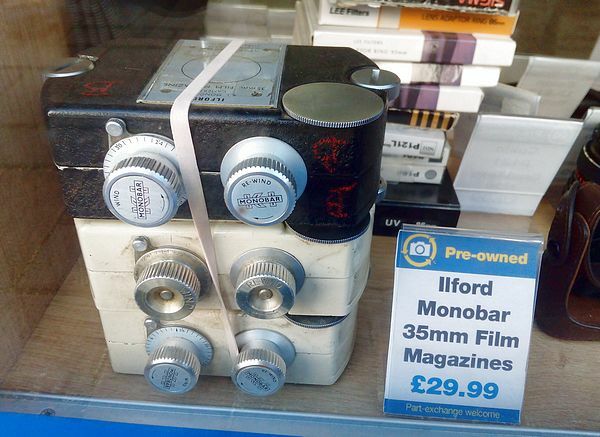 The Ilford 35 mm Monobar Camera, Type F, with one blank lens panel and one magazine £120 0s 0d. Lens 2 in. f/3.5 Dallmeyer in Compur shutter with cable release and mounted in Monobar lens panel £29 0s 6d. Lens 3 in. f/3.5 Dallmeyer in Compur shutter with cable release and mounted in Monobar lens panel £30 18s 10d. Lens 4 in. f/4.5 Dallmeyer in Compur shutter with cable release and mounted in Monobar lens panel £30 18s 10d. Lens 2.375in. f/6.5 Dallmeyer W.A. in Compur shutter with cable release and mounted in Monobar lens panel £26 19s l0d. Customers' lenses or shutters can be fitted to the lens panel for a small charge, according to the work necessary. Extra magazines £30 0s 0d. Extra blank lens panels £1 10s 0d. Annular flash attachment (300 joules) £25 0s 0d. This is the flash head only. The power pack is purchased direct from the manufacturers. Right angle focusing attachment £10 0s 0d."